The 22 K Hornet is representative of one of my favorite aspects of engineering—deep thinking and hard work to wring just a little bit more performance out of something. What the 22 K Hornet is, is a wildcat cartridge made by extending the case shoulder of the 22 Hornet forward to allow for greater propellant capacity. This is a sound move and should not adversely affect the structural integrity of the gun if the propellant can maintain the same pressure internally when the volume is increased. All that will happen is that the rearward bolt thrust will be increased but this is a non-issue from a bolt action weapon where there is no reciprocating slide mass. Capable of propelling a 55gr bullet at 2700 ft/sec, the 22 K Hornet rifle can deliver terminal ballistic effects similar to the 11.0” barrel 5.56x45mm rifle. Using soft point ammunition, this caliber can be used for small game hunting or for medium game hunting if you are a good shot. The most common usage of this cartridge is in single-shot firearms and in my opinion, a great choice of firearms for conversion would be the M6 Survival rifle or its “tax stamp free” brother, the Springfield M6 Scout. If you are contemplating a survival situation where 80% of your threat comes from exposure to the elements or lack or food/water and 20% of the threat (or less) comes from aggressive human beings, I strongly suggest that you look at the Springfield M6 Scout. This is an ‘odd’ little gun, but also a centerpiece of what is meant by “built for a purpose”. A quick inspection of the skeletonized features of the weapon reveal that it is designed to minimize weight. Minimizing weight is critically important in a survival situation because of your significantly reduced caloric intake during most of these events. You must minimize your effort and maximize your consumption of calories if you expect to survive in the outdoors. Touching upon the fact that survival situations range from ‘minor inconvenience’ to ‘unsurvivable for experts’ and everything in-between, it behooves us strongly to maximize our chances for success using technological advantages to augment our physical preparations. So what does lengthening the shoulder on the case and using the 40 degree angle ‘buy’ us in terms of ballistic performance? Basically nothing that you couldn’t accomplish with aggressive handloading. All of the standard disclaimers about this apply, but it is usually possible to far exceed the load data without catastrophic failure of the firearm. I do not recommend doing this unless you are professionally trained how to safely do this as you are working within the ‘safety factor’ of the guns design. 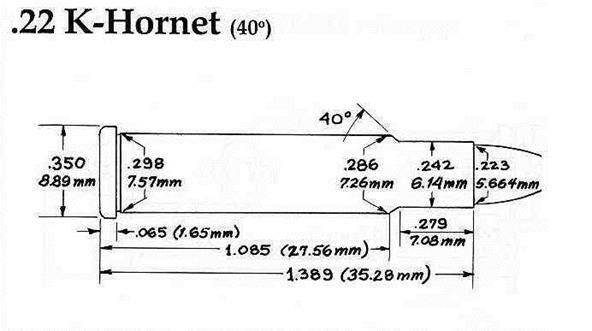 But the fact remains that it should be possible to get an extra 10% muzzle velocity from the Hornet simply by increasing the amount of propellant that you put in the case. 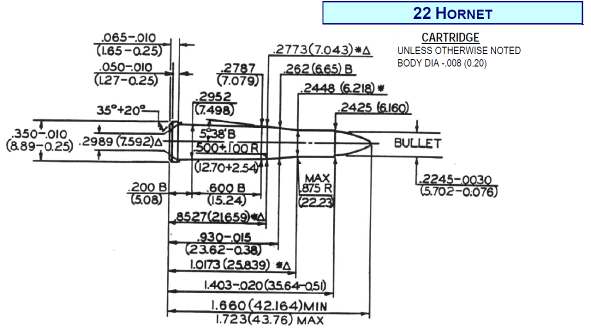 In just the same way, it should be possible to get an extra 10% muzzle velocity from the K Hornet such that your 40gr bullet now travels around 3300 ft/sec. The difference between a 22 Hornet and a 22 LR is the ability to reliably kill small to medium animals that are suitable for eating. Yes, we all have heard the story about Poacher Joe who kills deer (illegally) with 22 LR rifles. It remains to be seen if the normal game laws will stay in place during an emergency situation but suffice it to say that shooting larger game animals with a 22 LR or 22 Magnum requires great marksmanship ability to be successful. The 22 Hornet and especially the 22 K Hornet expand the options you have in terms of game animals that you can successfully harvest and increase the probability that you will be successful at your endeavor.